You are viewing the Yalsa15 tag archive. Saturday afternoon I attended the session Teamwork Makes the Dream Work: Connecting School and Public Libraries to Enhance Teen Services presented by school and public library representatives from Nashville who have been involved in amazing collaboration since 2009. It was in that year, thanks to then Mayor Karl Dean, that Limitless Libraries was started. We’ll continue coverage of the YALSA Young Adult Services Symposium all this week with more detailed session recaps of sessions that focused on collection development and content curation topics relevant to the Hub’s mission, but I also wanted to share links to session slides and other materials all in one place. Find the full program details here. For a recap in tweets, check out this Storify that highlights some of the takeaways and nuggets of wisdom attendees shared throughout the weekend. Take Five: What Was Your Favorite Moment or Takeaway of the 2015 YALSA Symposium? Hello, Hub readers! I got to spend the weekend learning, networking, and brainstorming with lots of teen librarians and library workers, authors, and other professionals serving youth at the 2015 YALSA Symposium. Fellow Hub bloggers and I will be sharing recaps of sessions the rest of this week, but we wanted to start off with a few of our favorite moments and nuggets of wisdom, advice, or ideas we discovered over coffee breaks and during presentations. What was your favorite moment or takeaway of the 2015 YALSA Symposium? I also always leave this conference in particular feeling a renewed sense of gratitude to be able to work with an awesome groups of peers and colleagues and serve teens full time. My overarching takeaway was the importance of framing our work and values; to stakeholders, decision-makers, patrons, concerned parents, colleagues, etc. Whether you’re framing goals and expectations for your own supervisor, to create a space to experiment (and potentially fail) with new programs and approaches, or explaining the values and research that drive collection purchases to concerned or disgruntled adults intent on censoring access or preserving a (limiting) status quo, good framing can help generate buy-in and understanding from all quarters. — Carly Pansulla Continue reading Take Five: What Was Your Favorite Moment or Takeaway of the 2015 YALSA Symposium? 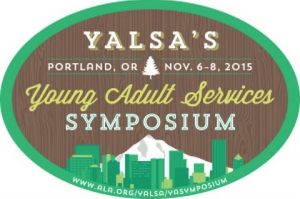 A number of The Hub bloggers attended YALSA’s awesome YA Services Symposium in Portland over the weekend. There were so many great sessions and authors there. In case you couldn’t attend the Symposium or missed this pre-conference session, here are some of the highlights compiled by Hub bloggers Carly Pansulla and Sharon Rawlins from Friday morning’s program called “Supporting Youth Learning Through Building Sustainable Partnerships.” All of the presenters were generous and detailed in sharing their experiences of partnering with outside organizations to better serve the young adults in their communities. *Know what you want out of a partner – What are the library’s goals for this relationship? What are the partner organization’s goals? Is the library looking for specific resources or expertise? Is the partner organization? Are these goals and expectations compatible?